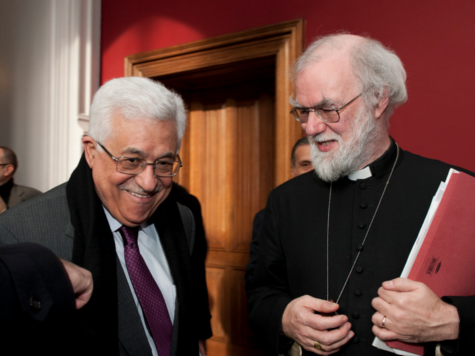 Britain’s recently retired Archbishop of Canterbury Rowan Williams has been found to be in support of an extremist, Khomeinist organisation that has hosted numerous anti-Israel protests in London. The Islamic Human Rights Commission (IHRC), which recently ‘awarded’ Breitbart London‘s Managing Editor with their ‘Islamophobe of the Year‘ title, is known for its support for Omar Abdel-Rahman, otherwise known as “The Blind Sheikh”. Abdel-Rahman was sentenced to life imprisonment in the United States in 1996 for seditious conspiracy surrounding the 1993 World Trade Center bombings, as well as plots to assassinate American politicians. While the former Archbishop is known for his left-wing activism, it may shock many to hear of his fawning praise for an organisation whose marches include prominent Hezbollah flags. Williams is quoted on official IHRC material promoting its ‘Islamophobe of the Year’ event, sponsored by the Iranian state-funded Press TV media organisation. He states: “The fact that prejudice and ignorance are ridiculous doesn’t – unfortunately – make them less lethal. But it is important from time to time to be reminded that they are ridiculous, and that’s why this event is so welcome. Williams – described as the ‘Arch-idiot’ by the Harry’s Place blog – should be aware of the IHRC’s hosting of Ibrahim Zakzaky in 2010. Zakzaky’s Nigerian-based Islamist group once referred to Jews as ‘the lowest of creatures on earth’ and ‘the children of monkeys and pigs’. The Islamic Movement of Nigeria also claims that Al Qaeda and Bin Laden ar myths concocted by Western intelligence organisations, and never existed at all. Williams, in flattering the IHRC, finds himself in the company of bizarre characters such as Lauren Booth, who is a Muslim convert and sister-in-law to Britain’s former Prime Minister, Tony Blair. Booth has previously been linked to terrorist outfit Hamas. Another fellow traveller is disgraced ex-Labour peer Lord Nazir Ahmed, who blamed a Jewish ‘conspiracy’ for his imprisonment after crashed into stationary driver whilst texting and driving in 2007.